All natural. Only 40 calories per serving. Rich in antioxidant vitamin E. 50% more calcium than milk (1 cup of milk contains 276 mg calcium vs. 1 cup Almond Breeze Unsweetened Original Almondmilk contains 457 mg calcium. Milk data from USDA national nutrient database for standard reference, release 23 .). Free of: dairy, soy, lactose, cholesterol, peanuts, casein, gluten, eggs, saturated fat and MSG; all natural with added vitamins & minerals; 50% more calcium than milk (1 cup of milk contains 276 mg calcium vs. 1 cup Almond Breeze Unsweetened Original Almondmilk contains 457 mg calcium. Milk data from USDA national nutrient database for standard reference, release 23 . ); an excellent source of vitamins D & E; made from real almonds; contains no added sweeteners; low glycemic index (GI); vegan. The preferred taste alternative. From the almond people. 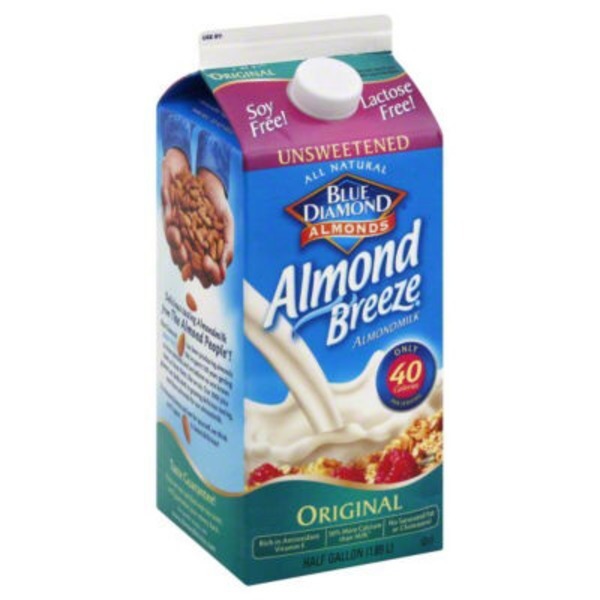 Almond Breeze Almondmilk is an all natural, great tasting, non-dairy beverage. It is rich and creamy with a pleasant aftertaste. Delicious tasting Almondmilk from the almond people! Blue Diamond has been producing almonds since 1910. We've spent 100 years getting to know almonds and we believe no one knows them, or loves them, like we do. Our 3000 plus growers are dedicated to growing delicious tasting, nutritious almonds for our almondmilk. Try Almond Breeze and see for yourself, we think you'll agree. It tastes delicious! Taste guarantee! This almondmilk is made from almonds that were not genetically engineered. Shake well. Do not freeze. Keep refrigerated. Use within 7 days after opening.